Assemble accurate data results with our analytical software for fitting distributions. 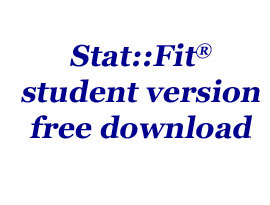 We are developers of the Stat::Fit® program that is both in-depth and user-friendly for fast and exportable results. Our data input software provides students with a visual tool for understanding data. This program provides you with a visual of the process by displaying the distribution shape of figures. We are proudly affiliated with various discrete-event simulation companies. Find out which simulation products work together with Stat::Fit® to get the most out of your results. Contact us today to learn more about our statistical software. Geer Mountain Software Corp., located in Pinehurst, North Carolina, was founded in 1993 to promote and support the increased use of computer simulation and statistical evaluation in the analysis of manufacturing and business productivity. Geer Mountain provides a statistical software program, Stat::Fit®, to analyze the data for discrete event simulation or other event driven modeling. The company also provides detailed analysis of manufacturing or business operations through simulation and advanced statistical techniques.